Dead at age 90, the 1972 Democratic presidential nominee embraced and inspired the struggle for peace and economic and social justice. 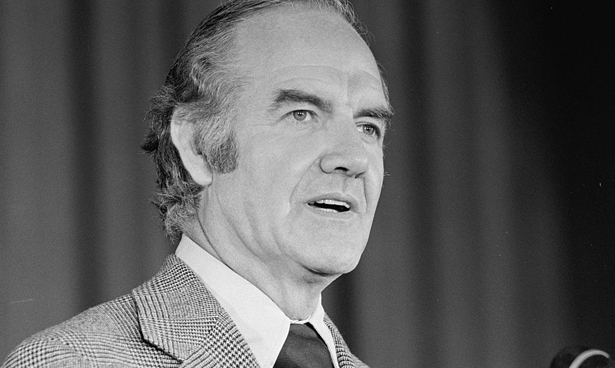 For the better part of his American century, George McGovern was America’s most prominent advocate for peace with the world and justice at home,a progressive internationalist and prairie populist—from the cold war era when he grabbed a South Dakota congressional seat from Dwight Eisenhower’s Republicans, to the Obama era when he prodded a young president from his own Democratic Party to bring the troops home from Afghanistan. McGovern, who has died at the age of 90, was an uncommonly human and humane national figure. It was that aspect of the man that made his 1972 presidential campaign as the most progressive nominee ever selected by the Democratic Party less of a political endeavor than a popular crusade. As with all crusades, the measure of defeat or victory comes not in the moment but on the arc of history that assesses the value of the vision and determines whether it will remain vibrant for generations to come. McGovern mounted his 1972 run as established champion of liberal causes who had served in the House and Senate before he carried the banner of his friend Robert F. Kennedy’s candidacy into the traumatic 1968 Democratic National Convention. And McGovern followed his 1972 defeat with another forty years campaigning as the elder statesman of an American left for which his name became a touchstone—even as right-wingers made “McGovernism” the name for the politics they most feared. Today, of course, America has accepted—or is in the process of rapidly accepting—basic tenets of McGovernism, from the principle that it is smarter to feed the world and treat diseases than to wage wars to the premise that a broad civil rights commitment must promote the progress of women, racial and ethnic minorities, people with disabilities and lesbians and gays. But McGovern was never satisfied; just weeks before the final illness that would take his life Sunday morning, he was traveling the country, rallying the faithful and preaching a prairie populist vision of full employment and healthcare for all. I knew McGovern for nearly half of his years and almost all of mine. We met in 1971, when my parents took me to see “the peace candidate” campaigning in Racine, Wisconsin. We spent a great deal of time together over the decades after he first entertained my adolescent questions; talking politics but also contemplating our shared passion for American history and literature. I remember an afternoon in Keene, New Hampshire, when I was supposedly interviewing McGovern about his under-appreciated campaign for the 1984 Democratic presidential nomination; we spent several hours trying to determine where Henry David Thoreau had stopped in the region during the week on the Concord and Merrimack rivers that would form the basis for one of the author’s finest books. McGovern was delightfully, and I dare say uncommonly, familiar with Thoreau’s canon. As he was with many of the other great American writers of the American Renaissance. Though his fellow anti-war senator and presidential candidate Gene McCarthy was better known for his poetic affiliations, McGovern was no slouch when it came to the writings of Thoreau, Emerson, Whitman, Emily Dickinson and the Alcotts. This was a soldier-scholar who as a decorated bomber pilot during World War II would pass time between missions reading the copy of Charles and Mary Beard’s 2,000-page The Rise of American Civilization that he had lugged into combat. And it was one of the great pleasures of our acquaintance to know that, even in the most heated of political moments, George McGovern can be drawn into a reflection on American history and letters. Perhaps if he was driven only by political ambition, McGovern’s presidential campaigns of 1968, 1972 and 1984 would have been more conventionally successful. Yet it was because of McGovern’s rich humanity and broad range that those who aligned themselves with his politics decades ago continued to cherish him—not just for his position papers but for the whole of the man. McGovern took it all in with a humility that was uncommon in American political life. He was always on a mission. He appreciated accolades but did not slow down to accept them. To the last, McGovern remained engaged, still mixing politics, history, literature and humanity in ways that only a handful of American presidential contenders—Thomas Jefferson, Teddy Roosevelt, Eugene Victor Debs (about whom McGovern the historian wrote), Henry Wallace (whose advocacy for international cooperation inspired McGovern the young World War II), Adlai Stevenson (with whom McGovern campaigned) and his dear friend John Kennedy—dared attempt. McGovern always practiced a politics that ran deeper than what we get from most Republicans, and most Democrats. It was a purer politics, a better politics, because it was so rooted in his love of America’s history, its literature and its possibility. For more in memory of George McGovern, check out "George McGovern: American Patriot and Truth-Teller."